As part of the preparations for REF2021 we are assessing the quality of research outputs for inclusion in our submission. To do this we are scoring all the eligible outputs against the REF quality criteria – originality, significance, rigour. The first stage of the scoring process is for all authors to allocate a score for their output (0, 1*, 2*, 3*, 4*) based on the REF quality criteria. We will then have peer assessment within the Institution and some outputs will undergo external independent assessment. 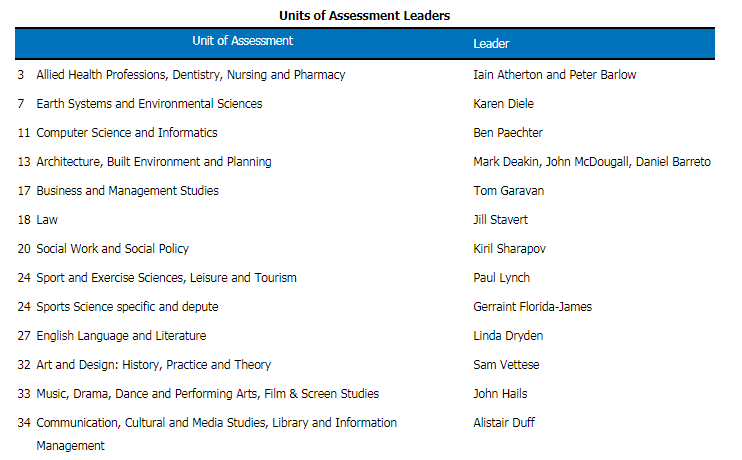 We have started the author scoring in all Schools and are in the initial stages of the institutional/peer scoring round for some Units of Assessment (UoAs). When you have outputs to score you will receive an email notification from Worktribe our Research Management System detailing the outputs to be scored. Why am I being asked to score my outputs when I am not REF-able? Even if you do not currently meet the criteria for REF submission there may be an eligibility period for you during the REF period. If you have outputs in this eligibility period you will receive a request to score them. Why have I been asked to score an output for another UoA? Some outputs are co-authored by people who are in a different UoA from yourself. The output will be scored for each UoA to assist in the decision process to determine which UoA the output should be attributed to. You only need to score the output for the UoA you are assigned to. I am leaving the University soon, why am I being asked to score my outputs? If you generated outputs you will have an eligibility period and your work will still be eligible for REF submission. We still require these outputs to be scored. Some of my outputs are not included in the list to score, why is this? If your output was included in the miniREF or the output in Worktribe is not recorded as published yet it will not be included in the request eg ‘In press’. In future rounds this will be updated to included all ‘In press’ articles. Why am I being asked to score outputs which are not Journal publications? There are many types of outputs which meet the REF criteria which are not Journal articles. Depending on the UoA you may be submitted to, these vary. There is the option to mark the output as ‘Do not consider’ for non-research outputs. Information on how to use Worktribe to score your outputs was circulated by email in Dec 2018 and Feb 2019. For other questions about using Worktribe to score outputs contact Lindsay Ramage: L.Ramage@napier.ac.uk.